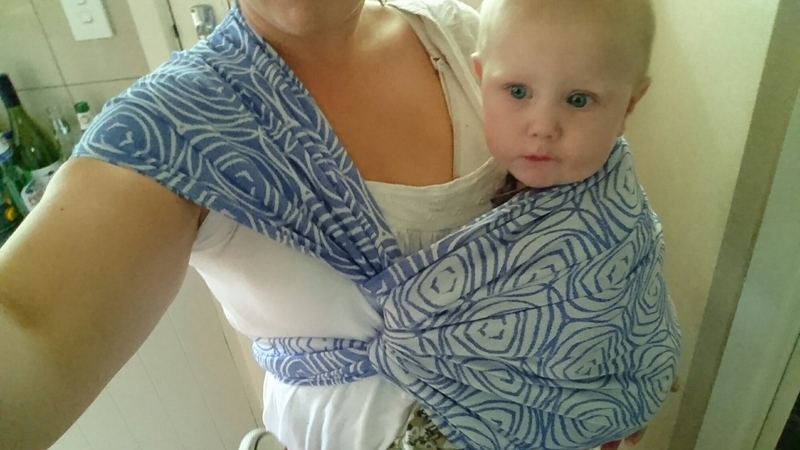 I was lucky enough to be sent a tester wrap all the way from The Netherlands from Tarabeau recently. The whole line is beautiful, but it was the pretty Neo that won over my attention most. Neo is a beautiful 50/50 blend of Egyptian cotton and finely woven silk. It was beautiful and soft straight out of the box! Certainly no heavy work required to break in or soften this wrap! The colourway was even more beautiful than what I had expected from pictures and both sides are as vibrant and striking as each other. 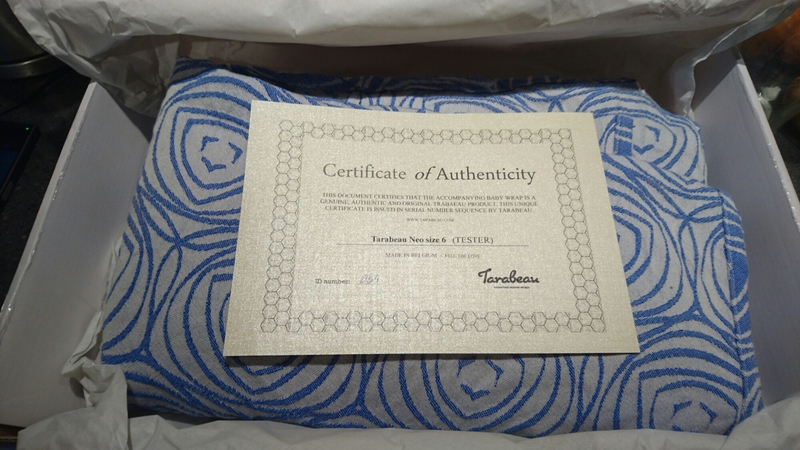 It has a very luxurious feel to it and is very visually striking when wrapping. I found myself changing finishes in a ruck carry as I didn’t feel like it was showing off enough of the beautiful print! I tried a few different carries in this wrap; kangaroo carry, FWCC, Poppins hip carry and ruck with both a standard and also Tibetan finish. I have found a poppins carry can be difficult to get secure in some wraps, the other silk wrap I have is way too slippy for me to yet achieve a good, comfortable poppins for very long. While a poppins is usually my preferred hip carry at the moment in a woven wrap, normally in silk it is not a carry I would attempt based off my past experience (I used a Robins Hip carry in my Ellevill Silk Blue for my sisters wedding as I couldn’t get a tight, secure poppins). In Neo that wasn’t an issue, the blend affords itself to a slight diagonal stretch which is really forgiving to wrap with. I was able to achieve a really comfortable poppins hip carry and successfully used it to battle a “nap strike” that had been going on for many hours with Mr 1! We also took Neo out with us for a trip to our local beach, Muriwai. Even before it arrived, there was something particular about Neo specifically from the Tarabeau range that made me think of the shiney black sand beaches and blue crashing waves out there. After my husband showing me some of the snaps he took for me, it certainly lived up to that expectation and there are also soo many beautiful photos from that trip that a slideshow is probably the best way to share them! We specifically went to Maori Bay, which has a rather steep and decent walking track to get down to the beach. We also had to navigate some pretty rocky terrain as the recent weeks of storms and king tides have eroded the sand and changed the beach landscape. Initially I had Jai in a hip carry for the walk down and attempted to put him in a kangaroo carry for the beach walk which he wasn’t having a bar off! So I resorted to a ruck and we went off exploring the rock pools, having running races with Mr 3.5 and finding starfish. We walked for well over an hour, maybe closer to two… the wrap and carry, even with only a single pass, were definitely comfortable for that time. We would have probably explored for longer if it wasn’t for the cold winter sea wind, despite the sunny skies! The colours and print are really versatile and match with pretty much anything I could find in my wardrobe. And it truely has been, for me, a pleasure to get to host, try and play with Neo! 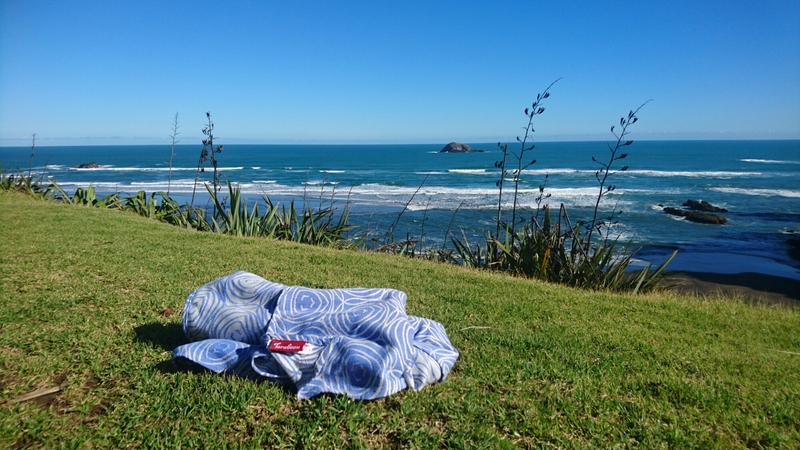 I am a little bit sad to have to pass it on, but excited for Neo to continue to New Zealand tour and for other Kiwi babywearers to discover the beautiful work from Tarabeau! Check out Tarabeau on Facebook or Instagram for some pictures of the other beautiful wraps in this line. Awesome review! Gutted I never got to rub my face on it ? ?